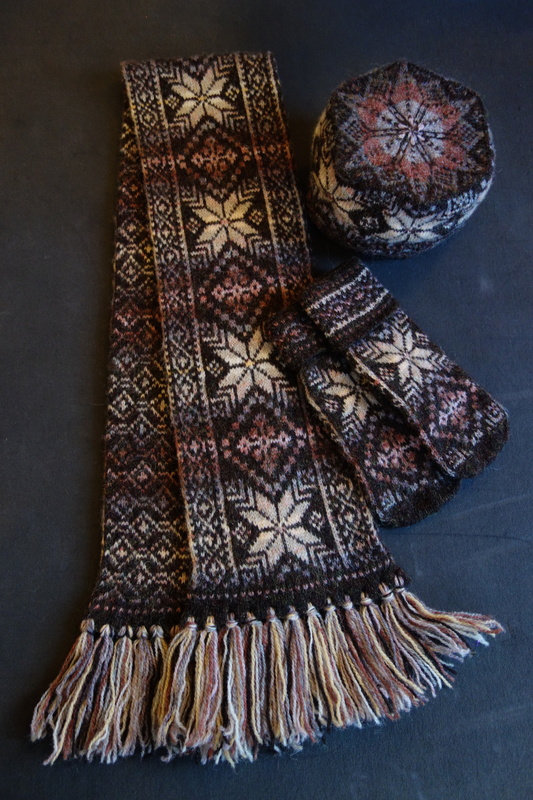 An accessory set comprised of pillbox style hat with hexagonal crown, fringed scarf, and mittens, ca. 1998. 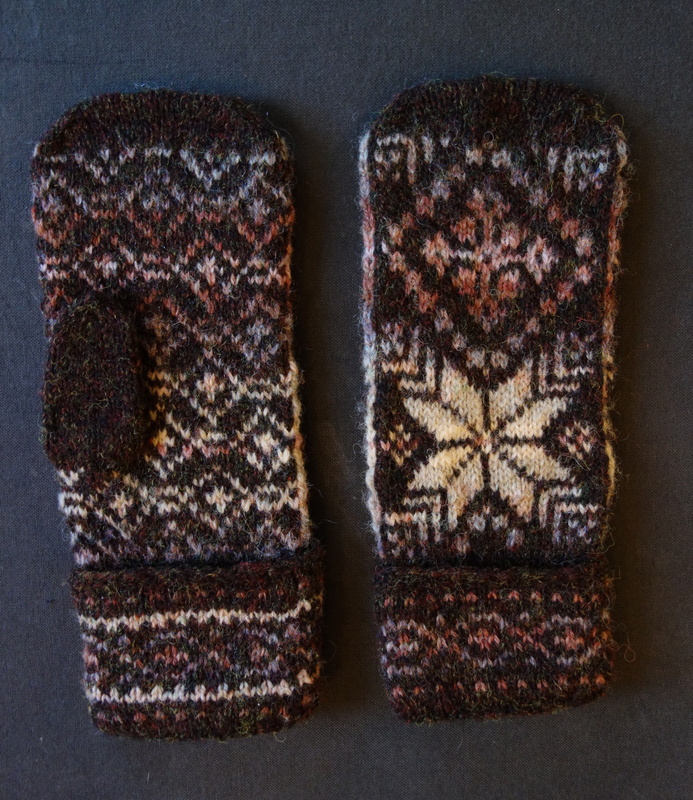 Designed and knitted by Anna Bell Bray, a noted creator of traditional Shetland garments. 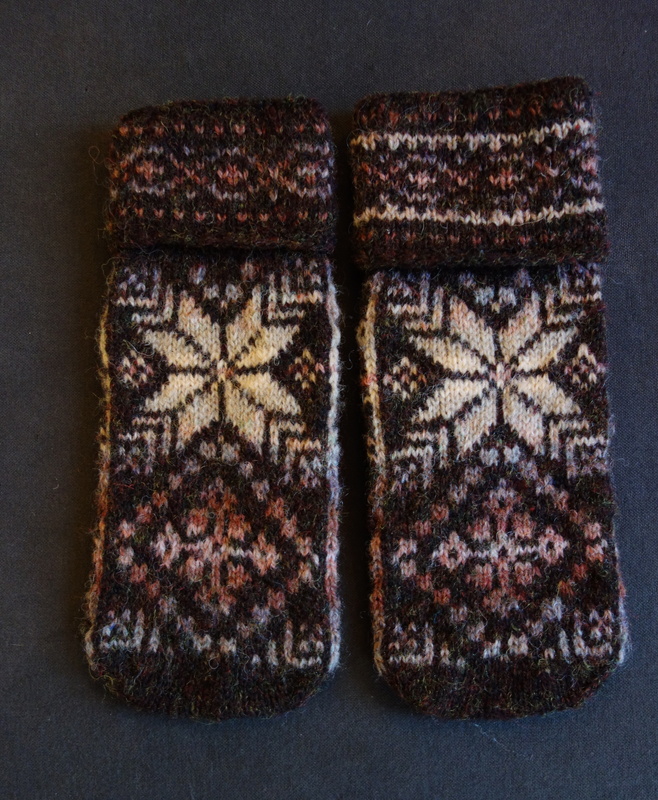 Purchased in Shetland, UK by Betty H. Lindsay for Jennifer Lindsay. Anna Bell Bray's work is distinguished by her painterly use of color and pattern, the interplay of dark and light values for maximum visual impact, and by the couturier details and finishes she gave to each garment. Her preference for knitting with pastel colors on dark backgrounds lends her work a distinctive, luminous quality. In this composition, pale peach stars dominate, while the darker diamond motifs recede against a network of tiny diamond patterns in the borders framing the center panel, and on the reverse sides of scarf and mittens. The star-patterned crown of the hat echoes the glowing star motifs. 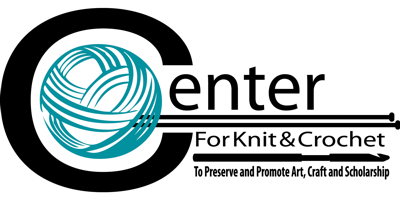 Materials: 100% Shetland wool in 9 colors. Diameter (measured from point to point on star-shaped crown) 6"
Note that Mitten 1 is slightly different from Mitten 2, and there are slight differences in the measurements for each. Alice Starmore included a photo of one of Anna Bell Bray's Shetland sweaters in Alice Starmore’s Book of Fair Isle Knitting, published by The Taunton Press, Newtown, CT, 1988. Starmore wrote on page 29, "Bearing testimony to the fact that the Oil Age has not entirely extinguished the genuine art of Fair Isle knitting, this 1986 sweater, designed by Annabel Bray, displays an elaborate use of border patterns, some of them asymmetrical.” Starmore further stated that Norwegian style patterns (like those favored by Anna Bell Bray), became popular in Shetland and Fair Isle knitting after World War II. Ibid at 26.